Apex Plumbing Supplies have a variety of different sized baths in stock and can order most baths for next day delivery to store. 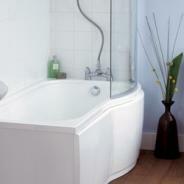 We supply baths from leading brands such as Kaldewei and Bette. We also have a selection of baths on show in our showroom which is open Monday to Friday 7am - 5pm and Saturady 8am - Midday. Apex Plumbing Supplies have a variety of different sized baths in stock and can order most baths in for next day delivery to our shop. We also have a selection of baths on show in our showroom, which is open Monday - Friday 8am - 5pm and Saturday 8am - midday. Alternatively have a look below at some of the bath ranges we supply and contact us for any further information.